For all his wealth and success, Asher Malacouti—the head of a prosperous Jewish family living in the Iranian town of Kermanshah—cannot have the one thing he desires above all: a male son. His young wife Rakhel, trapped in an oppressive marriage at a time when a woman’s worth is measured by her fertility, is made desperate by her failure to conceive, and grows jealous and vindictive. Her despair is compounded by her sister-in-law Khorsheed’s pregnancy and her husband’s growing desire for Kokab, his cousin’s wife. Frustrated by his wife’s inability to bear him an heir, Asher makes a fateful choice that will shatter the household and drive Rakhel to dark extremes to save herself and preserve her status within the family. Witnessed through the memories of the family’s only surviving daughter, Mahboubeh, now an elderly woman living in Los Angeles, The Girl from the Garden unfolds the complex, tragic history of her family in a long-lost Iran of generations past. Haunting, suspenseful and inspired by events in the author’s own family, it is an evocative and poignant exploration of sacrifice, betrayal, and the indelible legacy of the families that forge us. Parnaz Foroutan was born in Iran and spent her early childhood there. She received PEN USA's Emerging Voices fellowship for this novel, which was inspired by her own family history. She has been named to the Hedgebrook fellowship and residency, and received funding from the Elizabeth George Foundation, among other institutions. She currently lives in Los Angeles with her husband and two daughters. 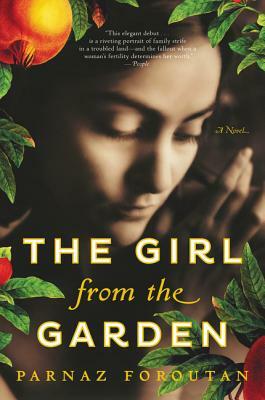 Set against the tumultuous backdrop of early 20th century Iran, The Girl from the Garden is an evocative tale of loss, betrayal and family ties. Parnaz Foroutan is a stunning new literary talent, and her debut novel is a gift to readers everywhere. In her debut novel, Parnaz Foroutan has written an incantatory tale of love, sacrifice and an unquenchable yearning for paradise. Foroutan unfurls a sensuous, poetic tapestry of gardens and seasons, of women enshrouded and silenced by culture, of men made intractable by honor, religious tradition and filial loyalty.